Sleep during the toddler years of life can be tricky; Growing babes are so easily stimulated and excited which is a beautiful thing but it can make bedtime a little difficult. As a parent to two toddlers (aged 4 and two) I consistently remind myself of how important sleep is to a young body. I’m often tempted to keep them up or out late because now, it seems, they’re old enough to push those bedtime boundaries. But, the reality is that toddlers need adequate sleep to successful manage their daily actions so it’s more important than ever to enforce bedtime and help them make it through the night. Struggling to get your child to sleep? Our boys always say that they’re not tired but as soon as their heads hit the pillows, they’re fast asleep. In fact, the more they protest bedtime (or try to distract us with one book after another) the more tired they likely are and they need rest. The good news is that falling asleep is a habit, and all kids can learn it. It may take some time to develop that habit, but your child can learn to put themselves to sleep. If your toddler is fully energized throughout the day, you cannot expect them to go to sleep immediately just because you announce that it’s bedtime. Try to make the last two hours before bed calm and quiet. It’s a perfect time for independent play, colouring, books, bath and any other calming activity. Avoid screens because they prevent the mind from producing melatonin which is needed for sleep. Come up with a timetable that works for your family based on when you get home from work/school etc. Try to incorporate things like dinner, bath, bedtime stories, prayers or blessings, potty time, snuggles or anything else that your kids tend to like before bed. Don’t think of bedtime as a chore that takes a long time to accomplish but rather try to see it as the best part of the day when you get some quality time with your little ones. A simple change in mindset can go a long way. Try to stick to your schedule on weekends too. Toddlers need a set time to go to bed every night so that their body begins to expect sleep. Most of the toddlers do better when they are put to bed earlier rather than later. We put our boys into bed by 7:30pm and the later we push that time the longer it seems to take for them to fall asleep. We’ve been told by a couple of sleep experts, to move bedtime earlier rather than later if kids are having trouble falling asleep. It seems a little odd but the more overtired children are the more restless the sleep. Children go through normal sleep cycles in which they wake slightly and then settle into deep sleep again. Your goal is to ensure that discomfort doesn’t wake your child during those periods of slight waking. If your toddler kicks his covers off, make sure he/she sleeps in warm PJs with feet or a sleep sack. If your child wakes up thirsty, have a leak-proof water bottle or cup in their bed so it’s easily accessible. Our sons tend to grab their water, drink it, and fall back to sleep without waking up fully. Reading bedtime stories or singing lullabies with help your child to sleep peacefully. But try to avoid anything that’s too excitable (save them for daytime reading). Books about sleep, calming stories and learning books are good options. We’ve found that adventure books or anything that riles up the boys can stimulate their exploratory side and keep them awake. Kids really do sleep more soundly when they get more outdoor play. Even something as simple as grocery shopping or visiting a library (on those rainy days) can help burn off pent up energy. Laughter is essential to good rest because it reduces the stress hormones. Play an exciting game or tell silly jokes before dinner to get them laughing and easing any stress. If you help your child fall asleep with nursing or rocking, then when they wake normally, they are likely to look for you in order to help them fall back to sleep. Encouraging them to fall asleep on their own will set them up with a good sleep habit for life. 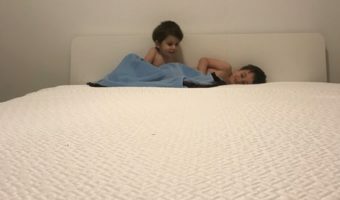 You’ll likely need to ease them out of using you as a crutch for bedtime so find a technique that works for you. If you’re like us and you enjoy those precious quiet moments (of nursing or cuddling), try to get those moments in at other times of the day. Overall, once you’ve mastered sleep habits at home, it’s a lot easier to get your kids to sleep in new environments when you travel. We’d love to hear some of your travel sleeping tips. Send us a message through our contact page!